TV Week magazine has announced the 2017 Gold Logie Nominees ahead of the announcement of the winners on Sunday, April 23, at Crown Entertainment Complex’s Palladium Room in Melbourne. 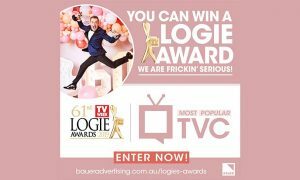 The TV Week Logie Awards will air on the Nine Network. Kicking off the nominations for the Best Personality On Australian TV is 2016 Gold Logie winner Waleed Aly. Waleed isn’t the only member of The Project team up for the big gong, with comedian Peter Helliar racking up his first Gold Logie nomination. Jessica Marais has been honoured with her second Gold Logie nod, thanks to her work in the Nine Network’s Love Child and Network Ten’s The Wrong Girl. Host of Family Feud and The Great Australian Spelling Bee Grant Denyer has also picked up a nomination for the second year running. Actor Rodger Corser has received his first TV Week Logie Award nomination for his work in Nine Network drama Doctor Doctor and ABC drama The Doctor Blake Mysteries. Samuel Johnson has also earned his first Gold Logie nomination for his role in the Channel Seven miniseries Molly. In addition to winning a prestigious TV Week Logie Award, the recipient of the Graham Kennedy Award For Most Outstanding Newcomer will receive a one-year management contract in LA with Australian Artists Management, as well as a TV Week photo shoot.